I don't know what sent me over the edge, but there definitely came a point when I couldn't take it anymore. Everyone else seemed to have one and I felt deprived and a wee bit resentful. So, I took action. For years I've been using a store-bought pincushion which has been growing more and more ratty with time. It had gotten so bad that I'd stopped returning the pins to the pincushion and they'd scattered around my studio. Couple that with all the cute pincushions I'd seen on the internets and I was ready to remedy the situation. I've had a minor obsession with hexagons lately so it seemed appropriate that my pincushion should take that form. I was super happy with the way it turned out and quickly adorned it with pins gathered from table and floor. My joy lasted a good five minutes before I started wishing I had a another pincushion devoted to needles. Spurred on by my initial success I made a second one, but with a little variation. I string pieced the parts of this pincushion and focused on fabrics in shades of red for the body and paired that with an aqua fabric for the binding. 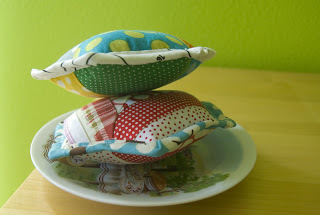 Having righted the wrong that is having to use a crappy pincushion, I felt inspired to share my joy with others. 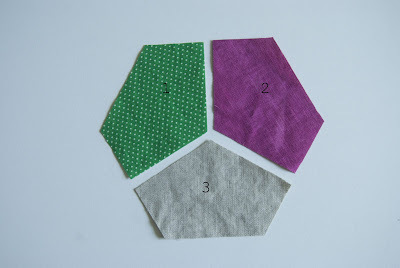 Knowing that you all are a crafty bunch I've written up this tutorial to help you make your own Hex Pincushion. The tutorial includes a template which I'll include as an image in this post. I'm guessing you can run your cursor over that image and print yourself a copy of the template. Edited to add: Reduce the size of the copy by 65% to get an accurate template. From binding fabric cut 1 1/2" strips on the bias. Note: To cut bias binding, I begin by making sure I have a straight edge along the lengthwise or crosswise grain. Align the short edge of a clear ruler with straight fabric edge along 45 degree line and cut. Reposition ruler so that cut line measure 1 1/2" from long edge of ruler and cut. Repeat to make more binding strips. 1. Referring to figure 2, pin piece #1 and piece#2, right sides together matching outer corner and center point. 2. Machine stitch together from outer corner to center point stopping 1/4" short of center point. 5. Starting at outer corner, stitch towards center, stopping 1/4" short of center. 6. Finger press seam allowance of pieces #1 and 2 towards piece #2. 8. Starting 1/4" from center, stitch to outer corner. 9. Press seams toward piece #3. 10. Repeat steps 1-8 to make a second hexagon. 1. Stitch together binding strips using diagonal seams . 2. Attach binding strip to right side of one of the hexagons as you would for a quilt top. 3. Align hexagon without binding strip underneath hexagon binding strip, wrong sides facing. 4. Pin hexagons together through center. 5. Turn binding toward underside hexagon. 6. Begin hand stitching binding, remembering to turn under 1/4" seam allowance as you work, to hexagon. 7. Gently miter the corners as you come to them. 8. 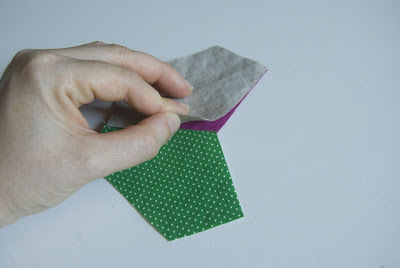 Stop short of stitching binding all the way around shape, leaving a small gap along one of the hexagon sides. 9. Stuff pincushion so it is full, making sure to push stuffing into corners. 10. Sew remaining binding to hexagon. 11. Machine top stitch close to binding seam. 12. Add pins and smile! A Wee Disclaimer: Feel free to make as many of these puppies as you like for friends, family, neighbors, and others suffering through life with store-bought pincushions, but please do not make these for sale. 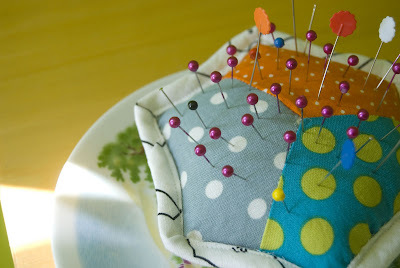 ok Wow - that is an amazing pin cushion. and a tutorial and all - you are so great! I'm just continually blown away by your creations! that is a very cool pin cushion. thanks for sharing!! i love this...so cute. my pins are in a bucket...stab myself everytime i reach for one...i'm making this! oh, i love the string pieced version! thank you so much for the tutorial! i'm off to make one because - these are adorable and - i'm still using the tomato. Well, here I am in the same tomato-pincushion boat. I really must make this. Thanks for sharing the how-to! Cute! It would be good to have the different colors to use for sewing machine needles too. 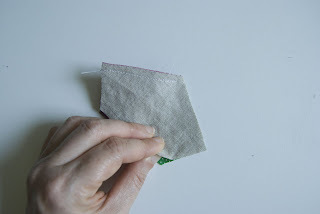 Then you know if you have taken out your Jeans needle and put in a fine one, Use denim to remember the jeans needle, or the one that you quilt with in another section, etc. an extra addition to your pincushion could be a Brillo pad in the middle of the stuffing. It cleans the pin, takes any burrs off the point, and kinda sharpens it at the same time. Mine only has a homely muslin cover right now, but I think I see one covered by a hexwrap in the very near future! Thank you for sharing. Love the pincushions. Those hexagon pincushions are too cute! Thanks for such a great tutorial! I must try this - it's so cute!! Don't know that I can add anything to what has already been said except to say, thanks for sharing with us. I just found your blog, and I have to tell you that your quilts make my heart go "pitter pat"! I can't wait to look around more!!! What a great little pattern, I've bookmarked it for future reference. Those are so cute! I think I will have to make some. Please check out my blog at www.thescrapbox-jordannichole.blogspot.com to find out more about my quilting! This is so cute! I just found your tutorial via WhipUp. The pin cushion is wonderful! I'd love to link to it if you didn't mind. This is just beautiful! 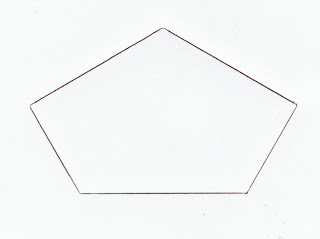 Great hex shape. Thank you for sharig this great tutorial. I've linked it on my blog. Oh, j'adore la chaîne reconstitué version! je vous remercie beaucoup pour le tutoriel! Je pars pour faire une raison - ces sont adorables et - je suis toujours en utilisant la tomate. qui est un coussin d'épingles très cool. merci pour le partage! i really like the info and pics. please keep posting kind of information. topic you have posted here. Good going friend ,woder how do you guys manage to be so different yet so creative. .I am anxious to know how this would really work.can you get me some more info on this similar topic? Wow ,..... Its amazing post. Nice creation. Generally I can not handle detailed and small works as I am a bit clumsy. But you have provided detailed step by step explanation that I do not think I can go wrong this time. Greatly appreciated. Love the cushions you made, they are so pretty. I am starting to make one for myself. I am just curious if I could manage to make one as good as yours. Oh thats so adorable. I will try that out now. Such a great idea. Thanks for sharing! 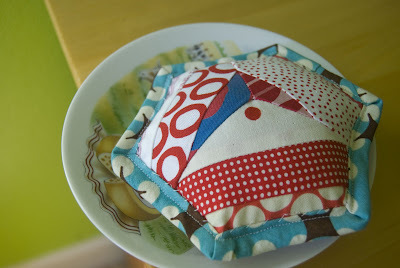 made a hexie pincushion last night BUT yours is different. Looks like a plan for tonight. Thanks, I have been enjoying your posts.